Providing professional and regular upholstery cleaning is important to keep your furniture hygienic and rid of unpleasant blemishes. You can use our services to maintain your sofas, seats, armchairs and other upholstered items clean and looking good. The upholstery cleaning which we provide in Hanwell is suitable for residential and commercial estates. You can get in touch with us by phone, e-mail, use our online chat or booking form. We will arrive at your address to inspect your upholstery, prepare and send your individual quote, done according to your requirements. Before starting the necessary cleaning work, our employees will inspect your furniture to choose the machines and detergents which they will need. They will estimate the time which the service would take and its price in advance. 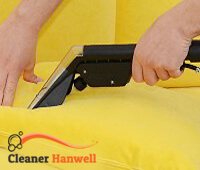 Our cleaning technicians will vacuum clean the sofas and armchairs. They will spray the spots, blemishes and dirty areas in them. The cleaners will disinfect the upholstery thoroughly using advanced steam cleaning machines and eco-friendly solutions. After that, they will hoover the upholstery with industrial driers and after a few hours it will be completely dry. The final stage of the cleaning process is deodorizing the upholstered items. Order the upholstery cleaning which we provide in and near Hanwell by calling us or using our online chat. Professionally cleaned sofas and armchairs look fresh and new and last longer. Our staff can provide the necessary cleaning procedures to disinfect your upholstery and remove the dust mites, stains and unpleasant odours which it had gathered over time. The upholstery cleaning which we provide is available in Hanwell every weekday and weekend. All you need to do is contact us using the services of our call centre or online chat.